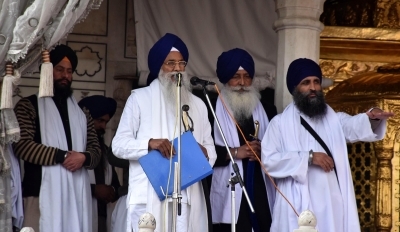 Chandigarh July 13 (IANS) The Akal Takht the highest temporal seat of Sikhism on Friday issued an appeal to the members of the Sikh community to ensure that drug abuse does not take place in their family locality village or neighbourhood. "I have issued an appeal to all Sikhs and everyone else to ensure that drug abuse does not take place around them. It is important for us to save the future of our youth " Akal Takht Jathedar (head) Gurbachan Singh said. Punjab Chief Minister Amarinder Singh on Thursday urged the Jathedar to appeal to the community not to resort to drug abuse and to strictly follow the path shown by the Sikh Gurus. In a letter the Chief Minister said that the Akal Takht had always played a pro-active role whenever the state faced any sort of crisis from a religious perspective. Pointing out that a sizeable chunk of the state s population had been in the grip of drug abuse for many years he said several youngsters from Sikh families had also fallen victim to it. "Though the government has already launched a vigorous anti-drug campaign its efforts needed to be further strengthened and supplemented " Singh said. The Shiromani Akali Dal which dominates Sikh institutions like the Shiromani Gurdwara Parbandhak Committee (SGPC) on Friday slammed the Chief Minister over the drug issue. "When we asked the Chief Minister and even offered to help in a joint fight against drugs in Punjab he refused to accept it. Now he is seeking the help of the Akal Takht and other religious institutions as his government has failed to control the menace " Akali Dal MP Prem Singh Chandumajra told the media here. Drug abuse is rampant in Punjab and many people have lost their lives due to the menace.